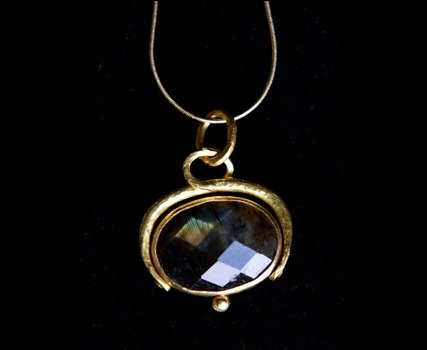 Dark, rich faceted labradorite set in 22ct gold in a ‘stirrup’ pendant. 2.5cm max width. Items can be purchased online using the option above. Alternatively, you can make a bank transfer, pay by cheque, or purchase at a pre-arranged appointment. Call us on (+44 (0)1843 448 291) to request more information or to book an appointment. Join our mailing list to receive the latest news and updates from Polly Gasston Goldsmith.